Every party features certain characters, and whenever I go to a party, I’m the hungry wallflower. I make my awkward entrance, quickly scan the room for people I know, and desperately try to locate the food table. I spend the next twenty minutes or so trying to not look too obviously antisocial as I attempt to slink along the shortest route to the food table with the fewest people I will need to talk to along the way. With all the slips, dodges, and potential pitfalls located between me and my goal, I often feel like I’m playing a video game. For my efforts, sometimes I’m rewarded with excellent junk food like DiGiorno’s pizza. (Once, late at night, in a strange mood, I baked a DiGiorno’s pepperoni pizza with kale on top. Don’t knock it till you try it.) Other times, I find myself happily scarfing down warm bread with salami and cheese. 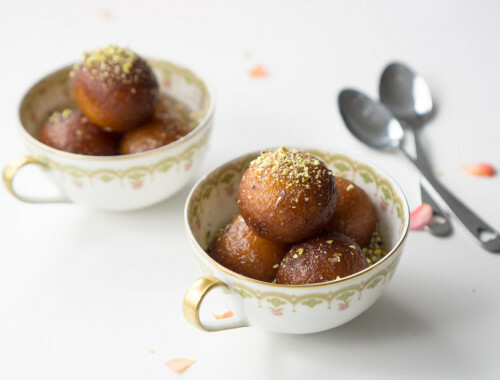 And occasionally, I get extra-lucky at parties and I find myself eating food that the host has prepared, the recipe for which the host is willing to share with me so I can recreate it to satisfy cravings at home. Julienned cucumber makes these spring rolls taste even fresher and lighter than standard spring rolls that use rice vermicelli noodles. 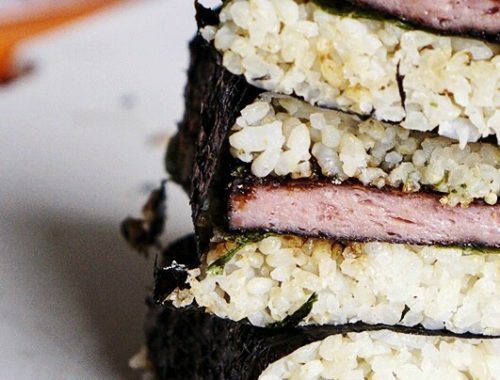 Bonus: the cucumber makes these rolls lower in carbs, if you’re counting calories. Sesame dipping sauce (called goma dare) instead of the usual peanut sauce adds an unexpected and zingy Japanese touch. 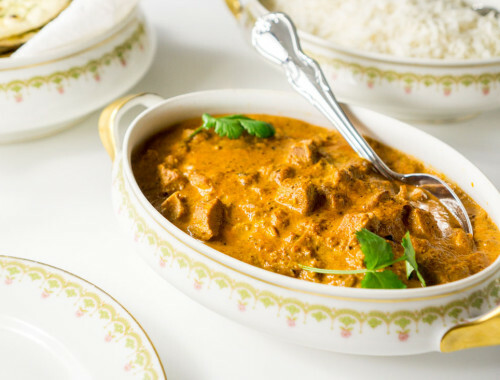 Christin’s mother usually uses a tasty jarred sauce, but because the sauce is hard to find even in most Asian markets, I’ve decided to include a recipe for a homemade version from the excellent Umamimart blog. Korean perilla leaves (gae nip) add a fresh and peppery anise flavor. If you don’t have a Korean market nearby where you can purchase perilla leaves, Christin says that cilantro is an acceptable substitute. 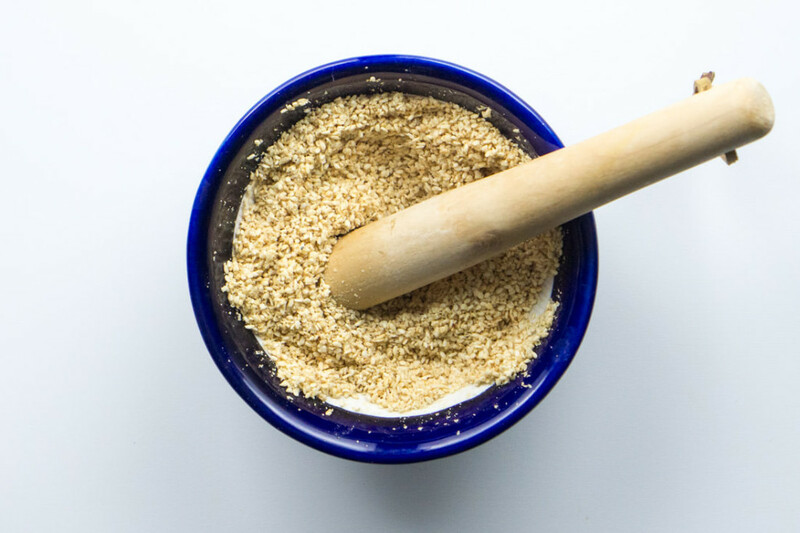 Making the sesame dipping sauce (goma dare) is probably the most time-consuming part of the process, simply because it involves many small steps, such as grating ginger and chopping garlic, and toasting and then grinding the sesame seeds. 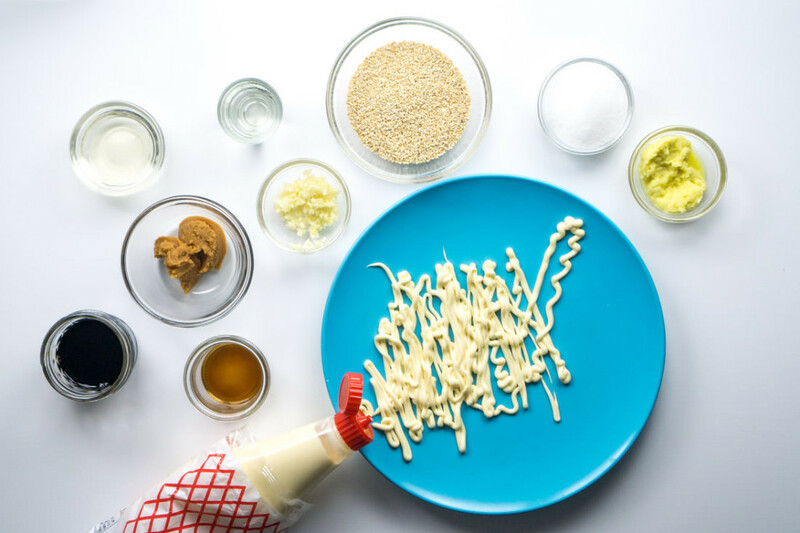 Also, I’d strongly suggest locating a bottle of Kewpie mayonnaise, a rice vinegar-based mayo that tastes like “umami incarnate.” You should be able to find it in most Asian markets for under $3 a bottle, or on Amazon for about $10. Next, toast your sesame seeds and let them cool. Grind the seeds using a mortar and pestle, clean coffee grinder, or blender. Mix the ground sesame seeds with all the other ingredients to make the sesame dipping sauce, and set the sauce aside. To make the spring rolls themselves, the most complicated thing you’ll have to do is to clean, devein, and boil the shrimp. If, like me, you purchased already-shelled and deveined shrimp, the only cooking you’ll have to do will involve boiling a pot of water. Place the cleaned and shelled shrimp in a pot where they are covered with several inches of simmering salted water and stir constantly. Stay vigilant. 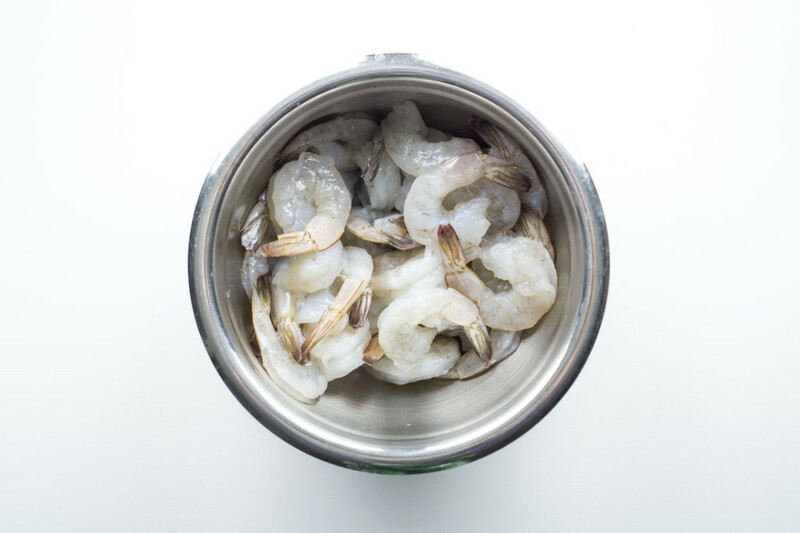 When one or two shrimp float to the surface, immediately remove the shrimp to a bowl filled with ice water to stop the cooking. Boiled shrimp, cooling off in their ice bath. While the cooked shrimp cool down in their ice water bath, prepare the julienned cucumber, romaine, and perilla leaves. Finally, you’re ready to assemble the spring rolls. Remove and discard the tails from the shrimp, if you haven’t done so already. Pour 1/2 cup of hot water into a wide, shallow plate or bowl. (A cookie sheet will also work for this purpose.) Dip the spring roll wrapper into the hot water, moving the wrapper around to wet it completely. You’ll have to strike the balance between getting the wrapper wet enough so that it softens to the point that you are able to wrap it around the fillings, but not so wet that it becomes a sticky mess before it even hits your wrapping surface. You’ll probably have to sacrifice several wrappers before you are able to determine how much to wet the wrappers, and that is absolutely okay. 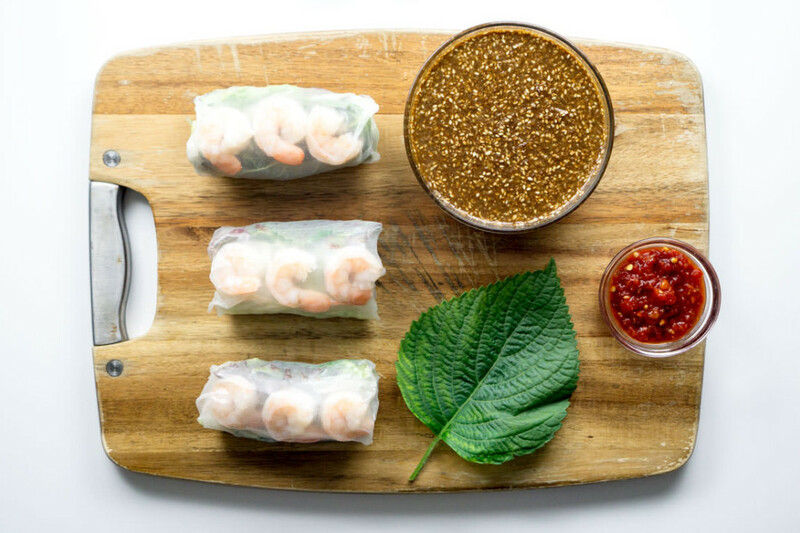 Four-step guide to wrapping shrimp rolls. Place the shrimp in the upper third, wrap the lettuce around a bunch of julienned cucumber, and fold and roll. Next, wrapping the rolls is both a fun and potentially-frustrating part of this process. I found this post to be very helpful in both its explanations and detailed diagrams. Line up the shrimp in the upper third portion of a wrapper and place a perilla leaf directly below the shrimp. Wrap a bunch of romaine around a few pieces of julienned cucumber, roll it into a cylinder, place the romaine-cucumber cylinder on top of the perilla leaf, fold in the sides of the wrapper, and roll up the spring roll while simultaneously tightly tucking in all ingredients. It might take you a few tries to make a neat roll, but no matter how they look, they’ll be chewy and delicious. Shrimp spring rolls with sesame dipping sauce and sambal oelek. Serve the spring rolls alongside your homemade goma dare sauce and with a little side of the tangy chili paste sambal oelek. Now that I have Christin’s mom’s spring roll recipe, it’s almost–almost!–enough to make me forgo my late-night DiGiorno’s snacking. Julienned cucumber replaces noodles in this lighter version of the traditional shrimp spring roll. Serve the rolls with Japanese sesame dipping sauce as a twist on the usual peanut sauce. Rinse shrimp in cold water and let drain dry. If you purchased whole shrimp, remove heads and peel off shells. Set aside heads and shells to make a quick stock for later use (see Notes). In a 5-quart pot, bring to a boil approximately 5 inches of water mixed with 1 tsp. salt. When water boils, add shrimp and lower the temperature to medium. Stir frequently until one or two shrimp float to the top of the water. When this happens, immediately remove shrimp with slotted spoon to a bowl filled with ice water. Let cool completely. 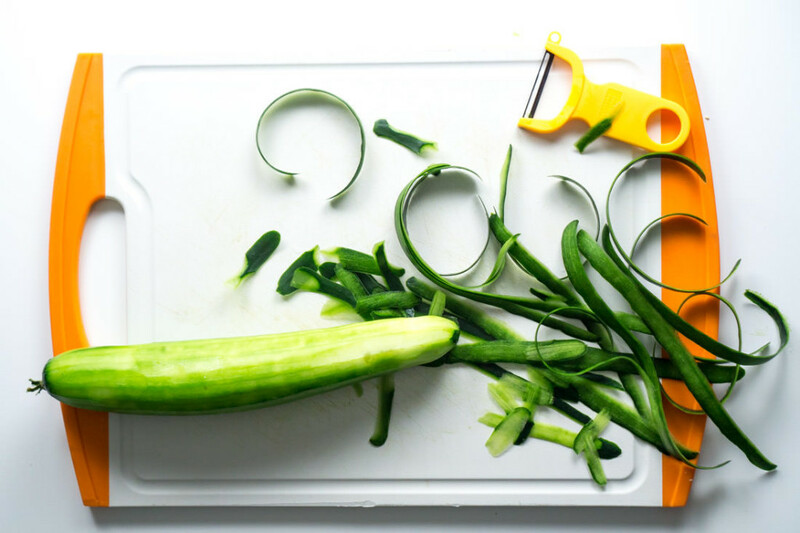 While shrimp cool, peel and julienne the cucumbers. Wash lettuce, pat or spin dry, and remove and discard center rib. 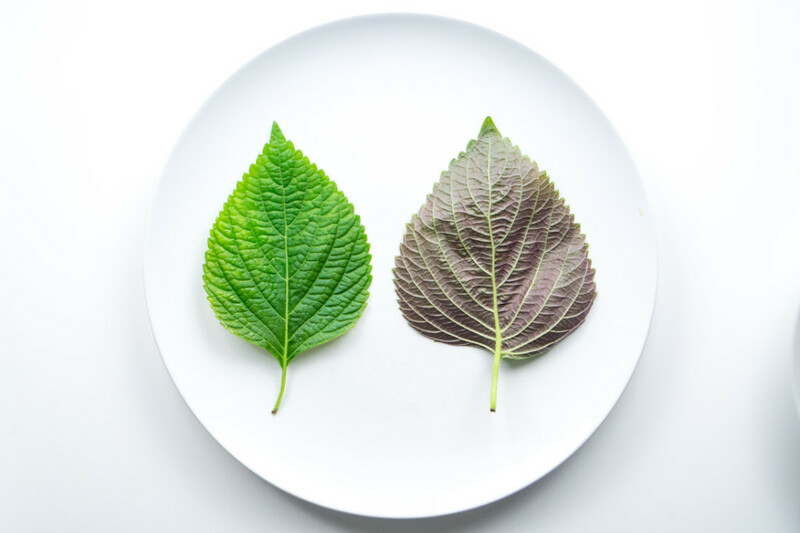 Wash, dry, and remove stems from perilla leaves. 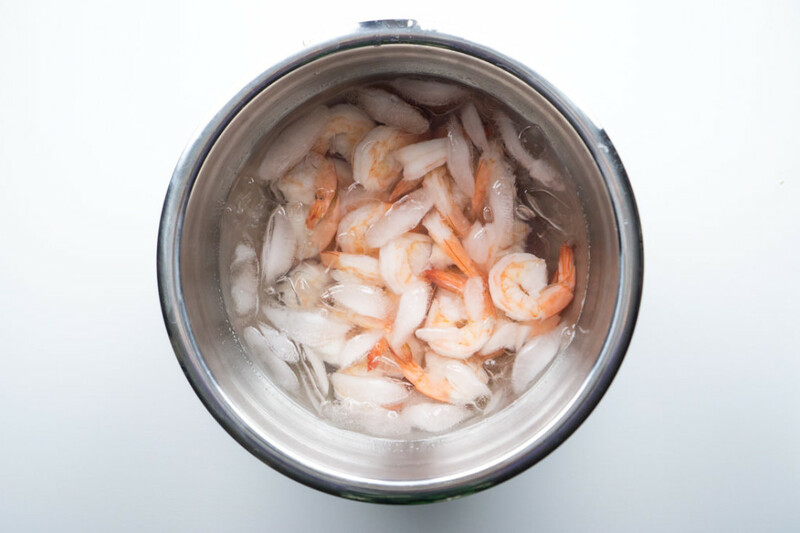 When shrimp are completely cool, remove them from ice water bath and pat dry. 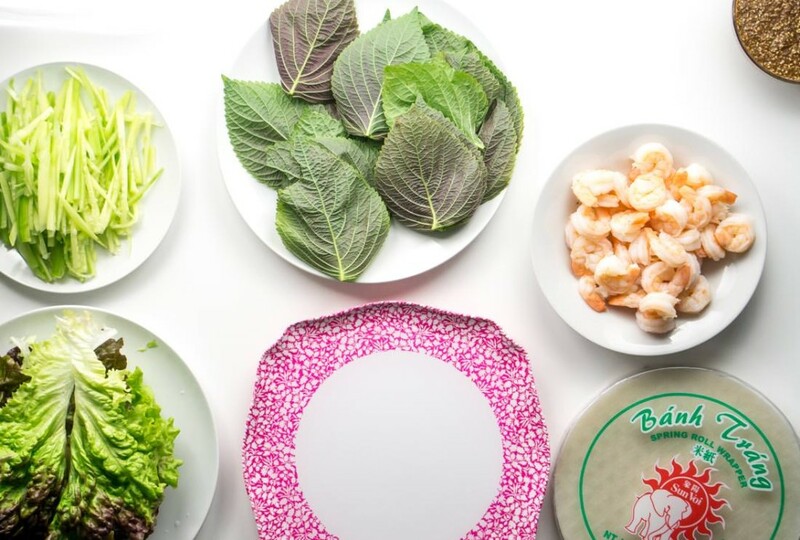 Prepare your spring roll assembly area: you should have a bowl of shrimp, a plate of lettuce, a plate of julienned cucumber, a plate of perilla leaves, a pile of rice spring roll wrappers, and a wrapping surface such as a clean cutting board. Add 1/2 inch of hot water to the bottom of a high-lipped clean plate or large shallow bowl. Working quickly, dip a spring roll wrapper into the hot water until wrapper begins to soften. This should take about ten seconds. 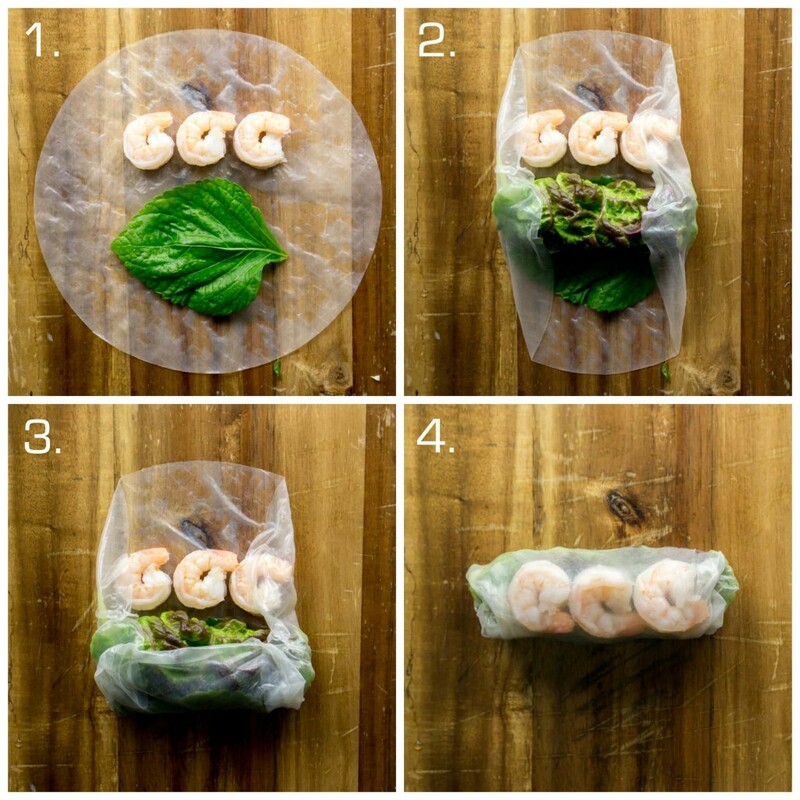 Place softened wrapper on wrapping surface, and add three shrimp to the top third of the spring roll wrapper (see diagram in main blog post). Place one perilla leaf under shrimp. Wrap a piece of romaine lettuce around a small bunch of julienned cucumber until it forms a cylinder, and place cylinder on top of perilla leaf. Fold in sides of the spring roll wrapper, and then start rolling wrapper from the bottom, ending with the shrimp at the top. Stack finished rolls on a plate at least 1 inch apart. Serve with Sesame Dipping Sauce and sambal oelek (chili paste). If serving later, wrap individual rolls in plastic wrap, refrigerate until ready to serve, and bring up to cool room temperature before serving. Toast the sesame seeds in a skillet. Set aside to cool. Grind the cooled sesame seeds with a mortar and pestle, clean coffee grinder, or blender. Mix the ground sesame seeds with all of the other ingredients, and whisk to combine. To make shrimp stock: place shrimp heads and shells in pot and pour in enough water to cover. Bring to a boil, and simmer for 15 minutes. Pour stock through sieve, let cool, and refrigerate or freeze for later use. Sesame Dipping Sauce adapted from Umamimart.